Yup, it’s that time of year again. Time to savor the last few weeks of summer and then prepare to say hello to fall! Aside from the craziness of beginning up school again, I really have no complaints about fall. And so, with fall rapidly approaching, I wanted to post a few more summer-like recipes before moving into the fall realms of squash and pumpkins. Spiral zucchinis into “noodles,” place in a colander (with a bowl beneath the colander) and sprinkle with a generous amount of salt. Set aside for zucchinis to release water. Preheat the oven to 375 degrees. Place oil in a deep skillet over medium-low heat and add onion, garlic, basil, oregano, pepper flakes, salt and pepper. Sauté for 5-8 minutes. Add in mushrooms and cook for another 5 minutes. Add in tomatoes and bring to a boil. Let cook for 10-15 minutes. Meanwhile, squeeze zucchini of all excess water and place in a bowl. Add in eggs, 1/2 cup cheese, and chicken and mix altogether. Once sauce in done, mix that in as well. 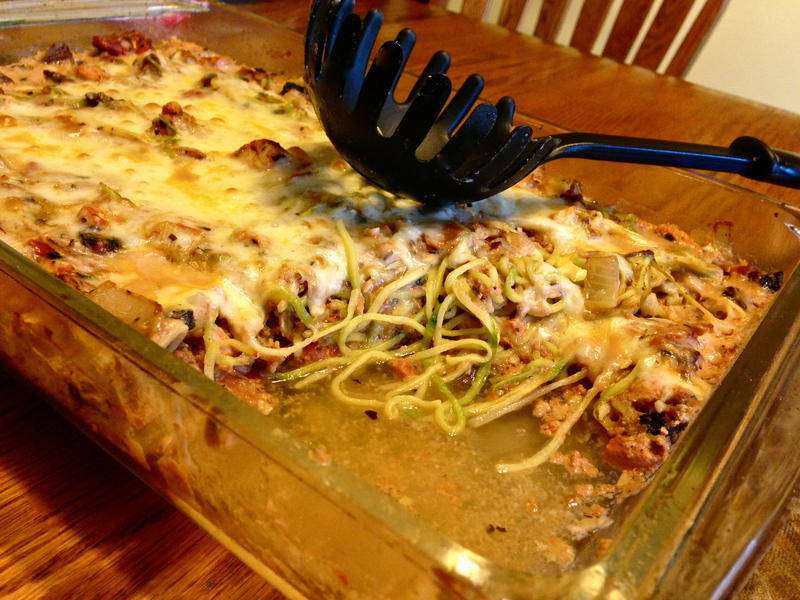 Pour entire mixture into a 9×13 baking dish and top with desired amount of extra cheese. Place in oven for 30 minutes. Once finished, let cool for 5 minutes to also baked pasta to set. Nice dish. Great for the summer.